Thomas Cole’s Refrain: The Paintings of Catskill Creek, will illuminate masterpieces from major museums and private collections, and explore the deeper meanings of Cole’s Catskill Creek paintings, considered as an integral series for the first time. The exhibition is based on new scholarship developed by H. Daniel Peck, Exhibition Curator and the John Guy Vassar, Jr., Professor Emeritus of English at Vassar College, in his book of the same title, published by Three Hills, (an imprint of Cornell University Press). 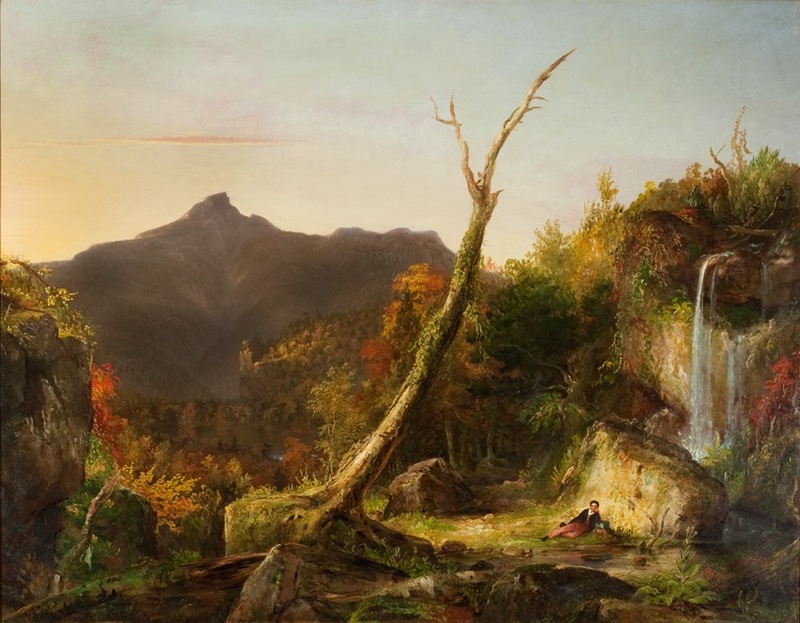 Created during the eighteen-year period between 1827 and 1845, which spans Thomas Cole’s mature career, the artist’s paintings of Catskill Creek constitute the most sustained sequence of landscape paintings he ever made. 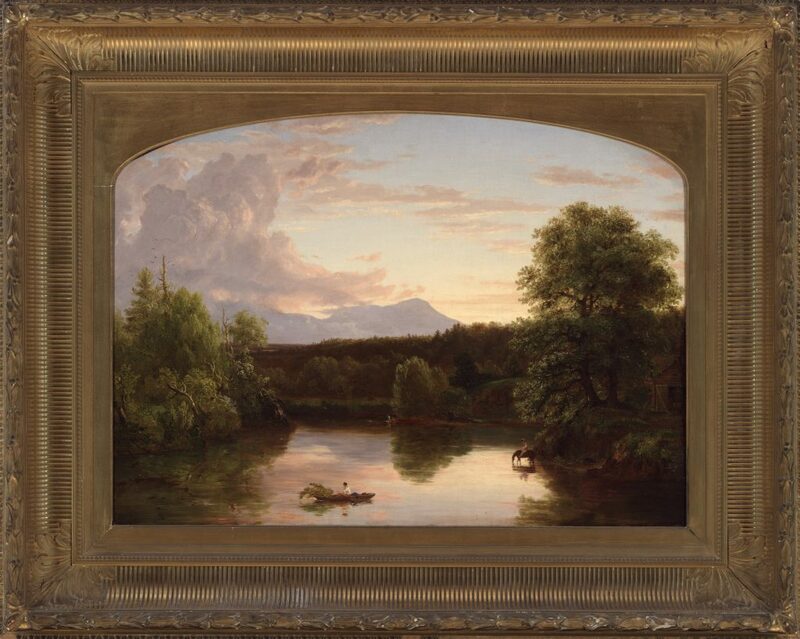 The exhibition includes twelve original oil paintings by Thomas Cole and represented, as well, are paintings of the Catskill Creek scene by leading nineteenth-century artists who were inspired by Cole: Asher B. Durand, Frederic Edwin Church, and Charles Herbert Moore. 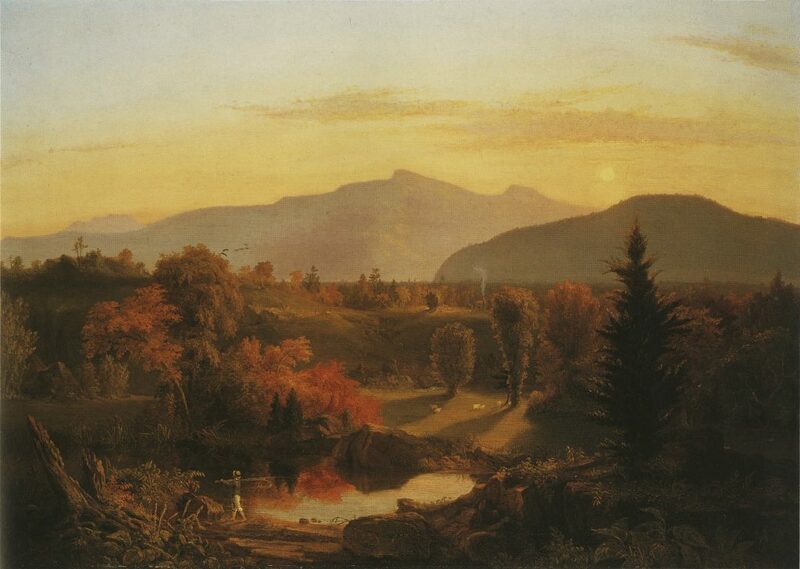 The works include Cole paintings from private collections that have rarely been seen in public: View Near Catskill, 1828-29, and Settler’s Home in the Catskills, 1842, as well as major works from the collections of the New-York Historical Society, Yale University Art Gallery, The National Gallery of Art, Albany Institute of History and Art, Olana State Historic Site, the Frances Lehman Loeb Art Center at Vassar College, Detroit Institute of Arts, and The Currier Museum of Art. The exhibition is presented in collaboration with Cornell University Press and the Hudson River Museum, with related programming in partnership with Scenic Hudson and Greene Land Trust. After the debut at the Thomas Cole National Historic Site, the exhibition will travel to the Hudson River Museum in Yonkers, New York, where it will be on view from November 21, 2019, to February 28, 2020. Thomas Cole’s Refrain is curated by H. Daniel Peck, John Guy Vassar, Jr., Professor Emeritus of English at Vassar College, with the Thomas Cole National Historic Site. Supported by the National Endowment for the Arts, Wyeth Foundation for American Art, Marshall Field V, the New York State Council on the Arts with the support of Governor Andrew M. Cuomo and the New York State Legislature, Empire State Development’s I LOVE NEW YORK program under the Market NY initiative, The Bay & Paul Foundations, the Enoch Foundation, The Educational Foundation of America, Joan K. Davidson through the J. M. Kaplan Fund, and the Kindred Spirits Society of the Thomas Cole National Historic Site. Read the exhibition press release. The exhibition tells the story of Cole’s discovery of Catskill Creek, with its Catskill Mountain background, and his ever deepening attachment to it over the course of eighteen years. The paintings contain mysteries— enigmatic figures, evocative human structures, and symbolic landforms – that tell stories of their own. This is a unique opportunity to immerse yourself in Cole’s stunning paintings of Catskill Creek and to visit the very place along Catskill Creek that Cole fell in love with nearly 200 years ago. The stretch of land depicted in the paintings has been preserved as a public park that is located just a few miles from the historic site. Cover image: Thomas Cole, Catskill Creek, New York, 1845. Oil on canvas, 26 ½ by 36 in. / Framed: 37 5/8 x 47 5/8 x 4 1/2 in. New-York Historical Society, The Robert L. Stuart Collection, Gift of his widow Mrs. Mary Stuart, S-157. Thomas Cole, North Mountain and Catskill Creek, 1838. Oil on canvas, 26 7/16 x 36 7/16 in. Framed: 40 1/4 x 50 3/16 x 4 ½ in. Yale University Art Gallery, Gift of Anne Osborn Prentice, 1981.56. Thomas Cole, View Near Catskill, 1828-29. Oil on wood panel, 24 1/4 x 33 3/4 in. Framed: 31 1/2 x 41 x 2 3/8 in. Private collection. 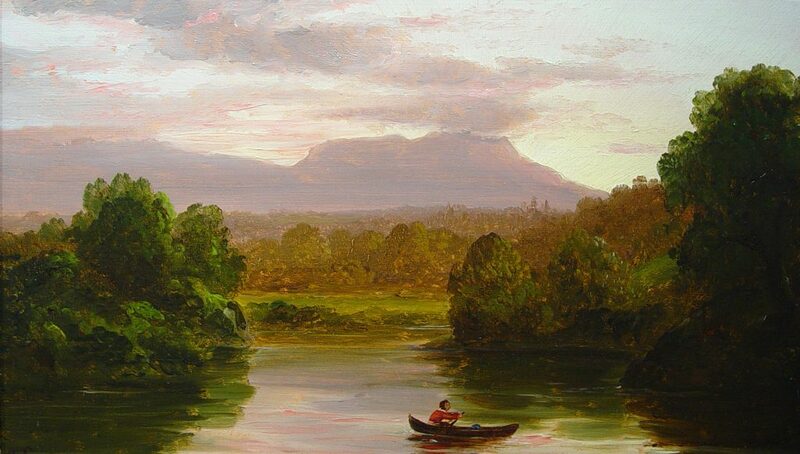 Thomas Cole, On Catskill Creek, Sunset, c. 1845-47. Oil on panel, 8 13/16 x 14 1/2 x 3/8 in. New-York Historical Society, Collection of Arthur and Eileen Newman, Bequest of Eileen Newman, 2015.33.8. Thomas Cole, Autumn Landscape (View of Mount Chocorua), 1827-28. Oil on canvas, 38 5/8 x 48 1/2 in. The Jack Warner Foundation, Tuscaloosa, Alabama.